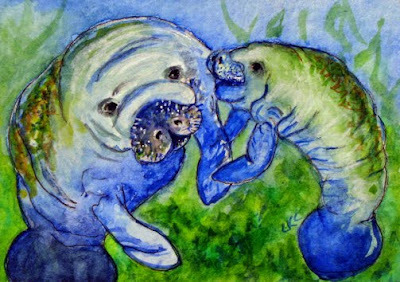 Manatees are such sweet aquatic/marine mammals. I thoroughly enjoyed researching them and watching several videos on Youtube showing individuals and families in man-made habitats and in the wild. These curious, very slow moving, vegetarians are in need of more protection from boaters and from garbage that pollutes their natural ecosystem. This was a fun painting to create - the mothers and calves have a special bond. I hope to learn more about these wonderful mammals. 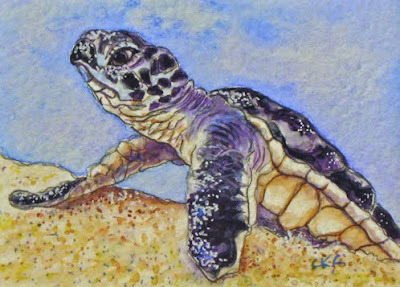 Sea Turtle Hatchling "Seaward Bound"
It's wonderful celebrating the beginning of 2010 with a baby sea turtle painting. I love painting these 'tiny wonders'. In this painting, the little one is heading seaward. Many moons ago, I had the pleasure of working with one of the most endangered of these beautiful creatures - Kemp's Ridley sea turtle from the Gulf of Mexico. What an experience it was to care for several very healthy active individuals. They grew so quickly and thoroughly enjoyed their meals of fish, squid and scallops. At feeding time - it was literally a splashing fest! The care taker was always soaked - I gave up on the apron idea very early on as it did not do much to keep my face, neck and shoes dry anyway. Enjoy the journey and have a wonderful 2010!